“Right from the beginning we felt at ease with Sam. It felt like he ‘got us’ as a couple and would work with us to make our wedding ceremony what we wanted. “He provided so many small tips in regards to structure and worked with us to write a more modern wedding ceremony that had the right balance of humour, while still capturing our love for each other. He delivered the ceremony so both young and old ears could hear and he radiated joy as he delivered it! “On top of this, Sam runs a very tight wedding rehearsal which means, come wedding day, you can just focus on the moment rather than worry about timings, where to stand, who is going to hold the flowers. He thinks of it all, so you don’t have to. “Our ceremony is one thing we will never forget! “It would not have been the same without Sam from Full Circle. “Sam was amazing to work with! Putting up with our quirky meetings, giving us loads of examples (we had no idea where to begin!) and keeping it stress free. 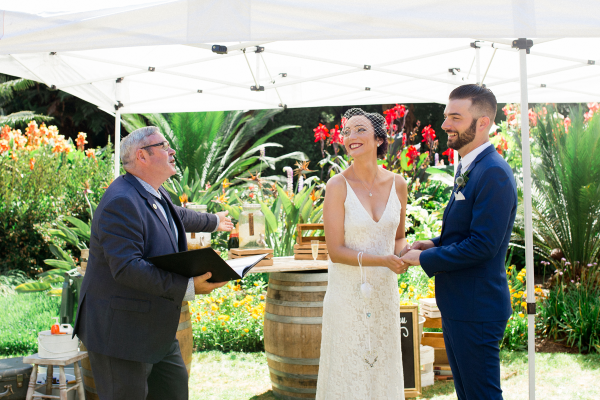 “We used Sam as our wedding celebrant in March this year. Would highly recommend! “Sam is very professional, yet still very personable and easy to get along with. The words spoken in our ceremony were serious, yet it was still light-hearted, and Sam had all off our guests laughing.